When I was child I watched in TV. then I saw Bakura and thats why made me watch it. The adventures of Yugi Moto and friends really is one of anime's strongpoints, but not necessarily for the reasons that make most things good. 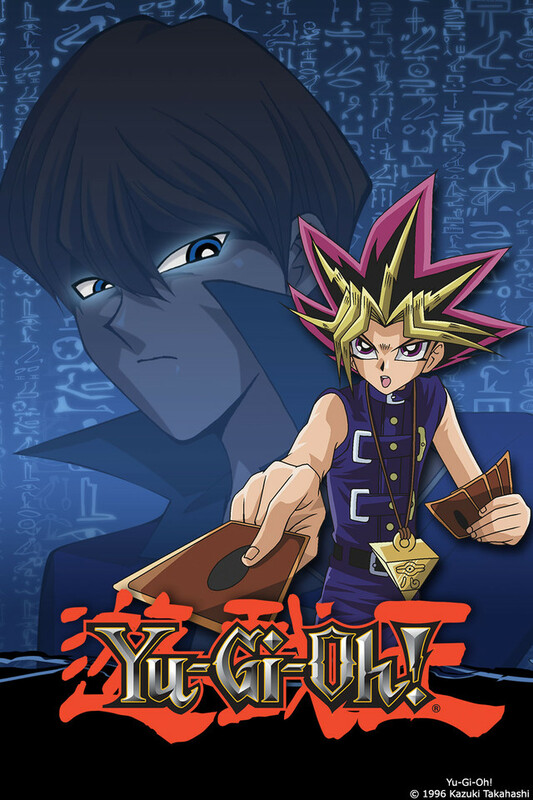 In short the story is mainly about young boy Yugi, who shares body with an Egyptian pharao and their struggle to keep ancient artifacts out of the hands of those who would use them for evil while at the same time (both during and after said conflicts) playing lots and lots of Duel masters, a game that was invented by the series author. As far as plot goes it serves mostly as a reason to showcase the very popular card game by way of giving the actual card game lore harkening back to the days of the pharaos and the different artifacts Yugi and friends must protect. It is servicable, but reminiscent of most battle manga out there, albeit with a more stationary approach to action. What sells it however is how everyone within the realm of the show buys into the concepts of the series with such gusto as to really, no matter if the fate of the world or just petty championship titles hang in the balance, get into the act of playing magic and wizards. Most if not all of the characters will shout out attacks and exclamations of victory or defeat in a way that makes the series a joy to watch, if nothing else than for the contextual sillyness of grown men and children alike being so emotionally or otherwise invested in what might just as well be a casual pastime. All in all, zealous battle is nothing new in the world of manga and anime, but you can do worse than investing time in Yu-Gi-Oh if those kinds of series are your cup of tea. This anime is so goood! I've been watching this since i was a kid and i still watch it.I JUST LOVE IT!Yugioh for life ^^.I used to watch it everyday after i came from school.I collected over 1000 cards and played with my friends.Good old days.For you who haven't watched it, go and watch this masterpiece! I was obsessed with this show as a kid and I always played the card game although looking back I think I didn't even know how to play it the right way, whatever. Anyway this show was always so cool and precious to my childhood and watching it again makes me really happy! Love to watch this as a Kid! I use to watch this on Saturday when i was bored it was the best show i thought i would never like it and the character and the plot are so good my fav character was anyone and other" hahhah I thought about giving up watching it but i never so i keep on watching. Love it! Love all Yu-Gi-Oh! Thats it they need Pokemon and Chaotic in CR ya hear me!!? Now that crunchy roll is starting to bring back old school anime, I am so happy and can't wait for other anime to appear. Many of these anime are unheard of by the otaku world we know today. I think that CR made the best decision to bring back the old and nostalgic favorites of the older otakus. Okay, now that I am done rambling about older anime, let me talk about Yu-Gi-Oh! Its amazing, that all you need to know. They put the idea of cards and monsters together and you get duels that seem strategic to those who are familiar about the card-dueling system. To others who just watch the anime, the graphics are surprisingly good despite how long ago the series was made.